Simplify your giving by setting up an automatically recurring monthly donation! If you already donate monthly, automating the process will save you time and, if you currently mail in your donations, postage, too! If you do not already donate monthly, please consider becoming a monthly donor. Monthly contributors make a major difference by allowing us to have a consistent and predictable monthly income to cover our ongoing program and administrative expenses. All you need in order to set up an automatically recurring monthly contribution is a PayPal account linked to a credit card or bank account. If you don't already have a PayPal account, it's easy to create one, and PayPal keeps your financial information secure. And, once you have set up an automatically recurring gift, you can change the amount of your monthly donation or cancel your recurring contributions altogether at any time by simply logging into your PayPal account and making the desired change. To set up an automatically recurring monthly donation, please create a PayPal account if you do not already have one. Then, select the amount you wish to contribute each month and the area to which you would like us to direct your contribution, click "Subscribe" and follow the prompts to make your contribution for the current month and complete the recurring donation sign-up process. For more detailed instructions on setting up an automatically recurring monthly donation, including what to do if the amount you would like to contribute each month is not listed, please read on! If you do not already have a PayPal account, create one now. Using the first drop-down box above, select the amount you wish to contribute each month. If you do not see the amount you would like to contribute listed, please send an email to us at info@petsaliveelpaso.org indicating the amount you would like to give each month. We will create for you, on a hidden page of our website, a special subscription button for that amount, then send you a link to that page so that you can set up your contribution. Your contribution will be used where it is most urgently needed. Any General Fund donations which are not immediately needed for basic overhead are applied toward whatever the next most critical need is at the moment! *Our "doors" are metaphorical. Our program coordinator works out of an office in her home, allowing us to save on utilities and avoid office rental expenses. Your contribution will be used to cover surgical and vaccination expenses related to our Feral Cat Program. Thanks to the immense generosity of our participating vets, this program is extremely cost effective. A donation of just $25 will neuter and rabies vaccinate a male feral cat, while spaying and rabies vaccinating a feral female can be done with a single donation of only $50. Larger and smaller donations are enormously appreciated, too! Small contributions of less than $25 add up quickly, and a large gift of $200 or $300 can sterilize and rabies vaccinate a small colony! Your contribution will be used toward surgical, vaccination and other costs (such as printer cartridges, paper, envelopes and stamps) directly related to our Spay/Neuter Voucher Program. Thanks once again to the tremendous generosity of our participating vets, a donation of just $40 is enough to neuter a male cat and a donation of $50 will spay a female cat or neuter a typical male dog. $60 will spay a typical female dog and $90 will spay or neuter a dog weighing more than 70 pounds or having a medical condition which makes the surgery more complicated than normal. On the non-medical expenses front, a $10 donation will buy just over a book of stamps and a $200 donation will keep the program in postage and office supplies for nearly a month! Click the gold "Subscribe" button. Review the description, terms and amount of your monthly contribution as well as any other information presented for your review. If satisfied, click "Agree and Pay" to make your contribution for the current month and complete the recurring donation sign-up process. 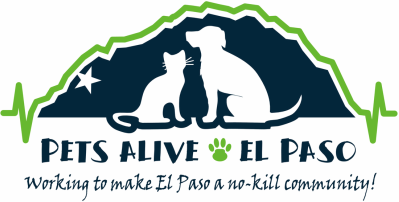 Pets Alive-El Paso is a 501(c)(3) non-profit organization. Contributions are tax-deductible to the maximum extent allowed by law.